Last day of the month and I hope your July has been a glittery one! Thank you to our great sponsors. 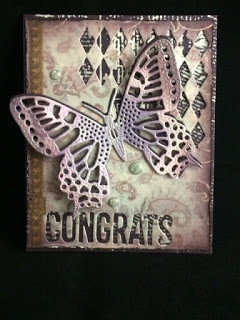 My card is using the Dragonfly panel by Bugaboo Stamps, along with Simon Says Postage Dies (But these by Taylored Expressions would work as well), and Spellbinders Sentiments Six Die D-Lites. 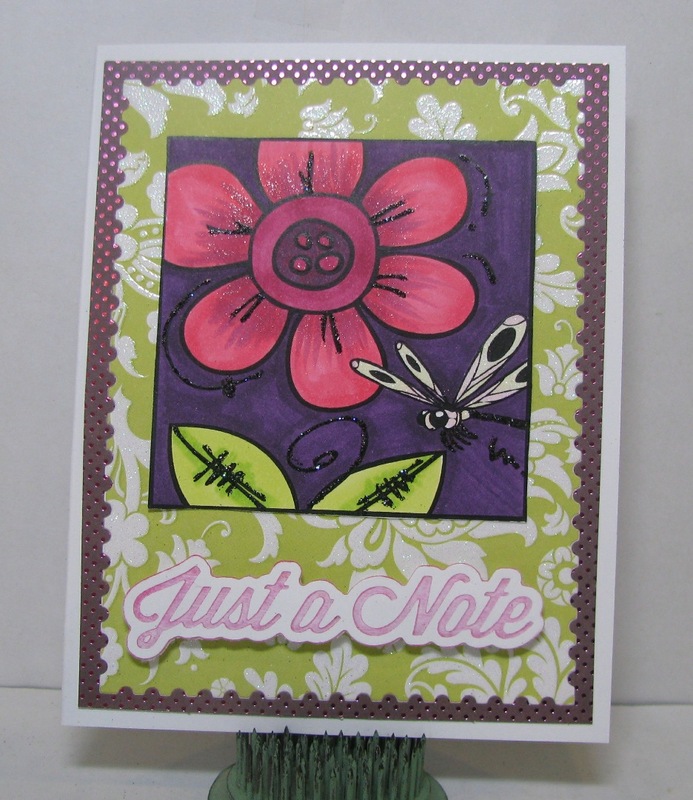 The green background paper has white glittered damask, and I used black Stickles to highlight the dragonfly and leaves. I had fun making a Christmas card with lots of glitter. I hadn't used this Bugaboo image until now and those stars are great accompaniments from "Boat" (ECD) at Dies R Us. 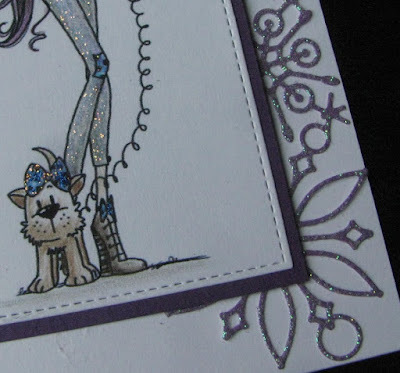 Dawn has used glitter to cut the Spellbinder frame for her Puppy Girl and to add some glittery leaves. 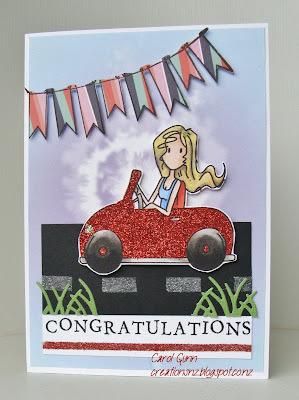 Monica used some Lawn Fawn products for her glittery finale! 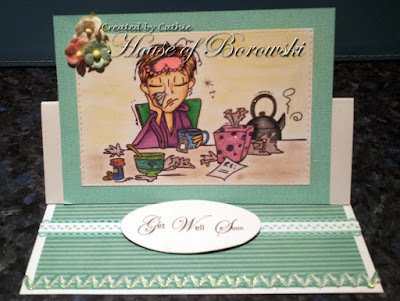 Be sure to see more info on the card on her blog. 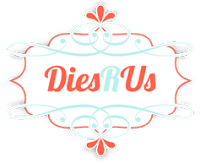 A Great Big Thank You from The Die Cut Divas! Just a few more days to join us with your glittery goodness this month. Check our side bar to link through to the entry page. 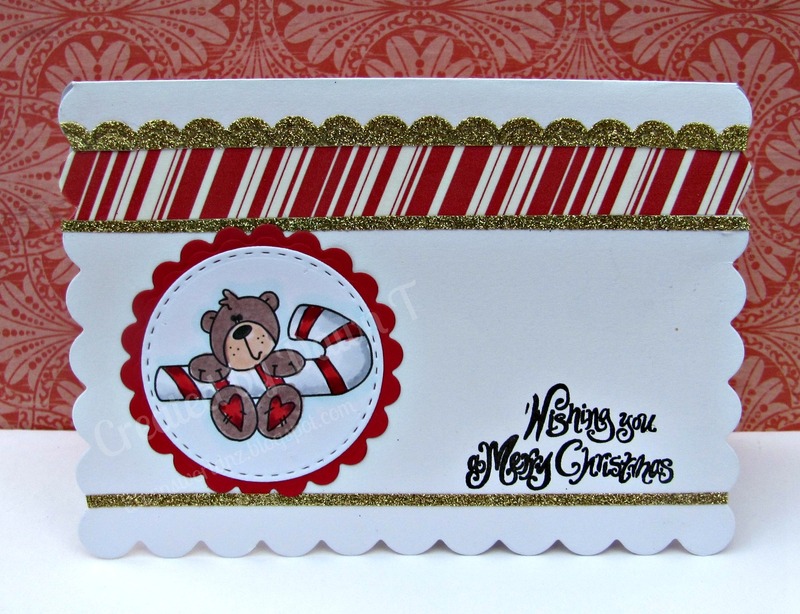 It's a glittery month at Die Cut Divas and for me too.. 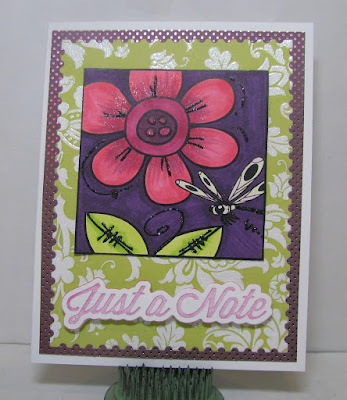 I am having so much fun coloring the Bugaboo stamps this month. Why STOP? Wishing someone a Happy Birthday with this great die couldn't be easier either. 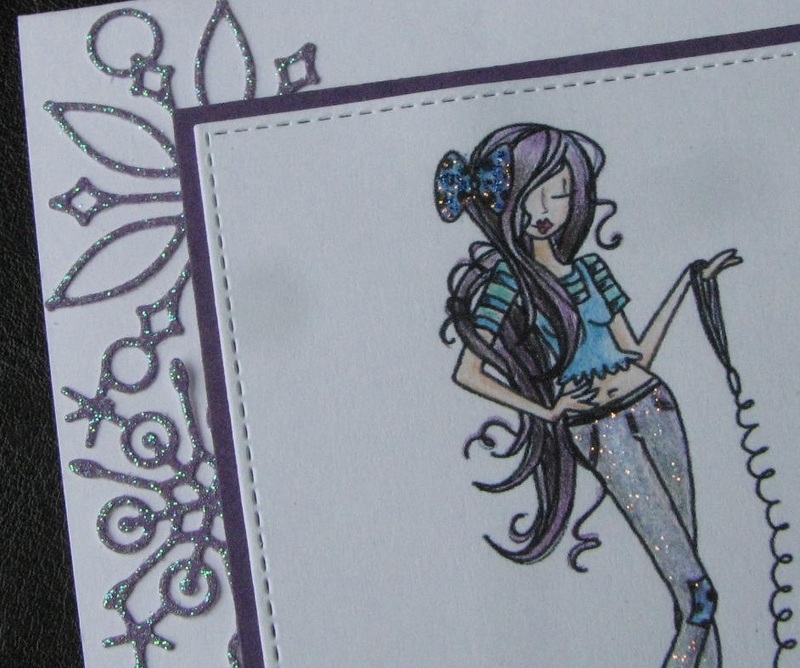 I loved using stickles to glitter up this gal. I'm also using up some of my papers as note cards. I like the way the stripes on this paper enhance the image panel. I cut a bunch of papers that I don't normally use into note card sizes and have them ready to use so I WILL USE them. This is a striking image and so neat to color. It's pretty obvious that our team liked this image too. You can find me at A Bit of This and That. July with the Divas: glitter - glitter - glitter! 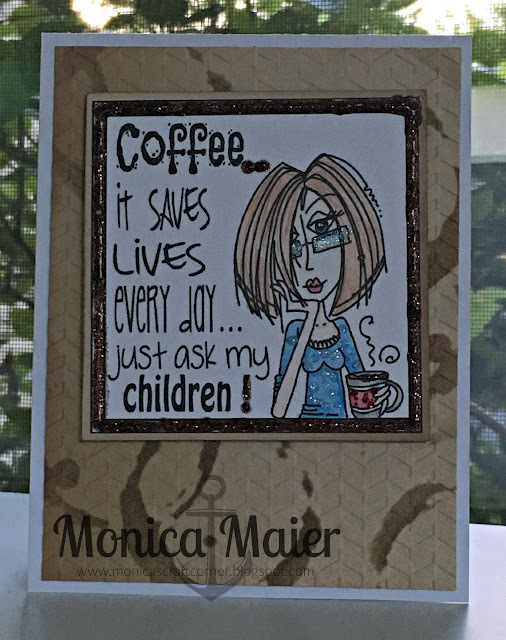 Monica dropping in today to share a card with you today. Don't forget to stop by the blog here and play along with us for your chance to win! I used this image from bugaboo. For more info please visit my blog here. My image is Puppy Girl (Bugaboo Stamps), colored with Copics. 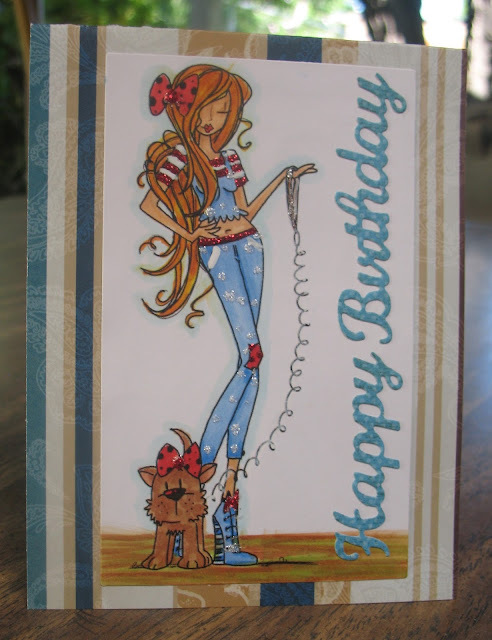 I used this Happy Birthday Sentiment (Spellbinders Sentiment One, but this one at Dies R Us would work well). The glitter scroll is from Michaels-perfect for me to use as the glitter doesn't come off easily. After I try working with other forms of glitter, my husband always asks me if I've turned into a stripper. How can one person get so much on themselves? There's more on me than my project! 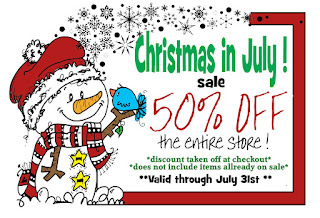 For more information, join me at Just A Nutter Paper Crafter. I think we all want to stretch our Christmas/Winter theme craft supplies. Today I used a snowflake die to embellish my card. Let's get right to it. I colored the Bugaboo Digi Stamp - Puppy Girl image with coloring pencils. The girl has purple hair, I was inspired by the daughter of my friend, she had purple hair at one point and I thought that was cool. I added stickles to her grey pants, and the bow in her hair and on the puppy. And I embellished with some purple glitter paper snowflakes die cut using Poppy Stamps Die - Frozen Flakes. I hope you would join in the fun and play along. 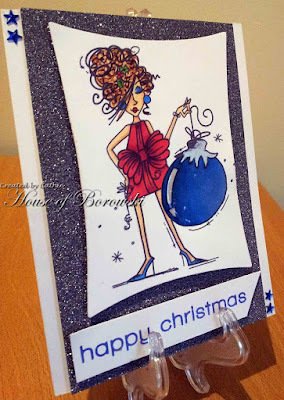 Hello, Cathie here with another glittery Bugaboo Stamps project. This is my first Christmas Card for the year and I am very happy with it. 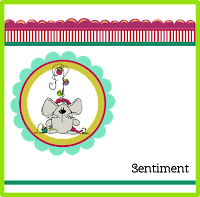 My image is a Bugaboo digital stamp - Christmas Cupcake Mistletoe. I printed it onto some Bristol paper and coloured with Tim Holtz distress markers. Added some glitter, Spectrum Noir sparkle pen and some glossy accents before fussy cutting it. My background is some watercolour tags, cut with an older Tim Holtz/Sizzix die (no available at DiesRUs but there are lots of amazing dies there to choose from) and trimmed the sides off. I added some sparkle and shimmer with Sparkle Medium from Imagination Crafts in the colour Welsh Gold. It is super sparkly. 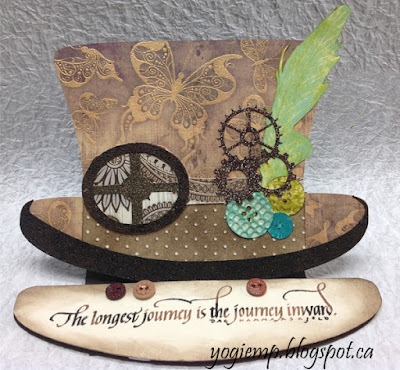 My sentiment is a WPlus9 one, cut from some shimmer card in a pretty brown. DiesRUs have an awesome supply of word dies for you. 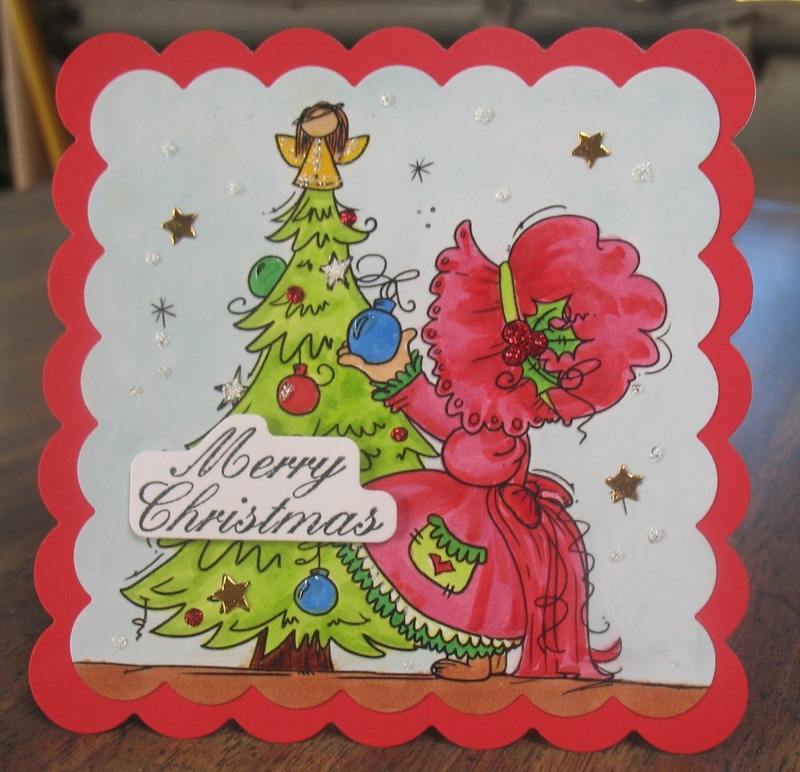 So looking forward to seeing all your glittery cards in the challenge. You can add your card here. 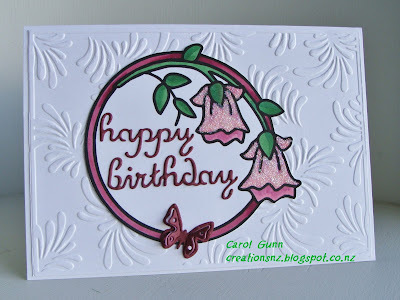 Monica here for the Diva's today sharing my card using this image from Bugaboo. For more info on the card please visit my blog post here. 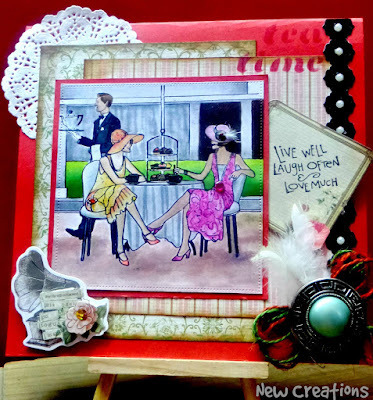 To join link up and play along with the challenge pop in here. For today's card, I use the Snowglobe Butterfly (from Bugaboo Digital Stamps) to make a shape card. And I adorned it with Marcel Flower (available at Dies R Us). I need a birthday card, so I replaced the sentiment by another. The snowglobe is coloured with Copics markers. I used Wing of Stella for subtle shimmer, then I used stickles on the butterflies and bubbles. 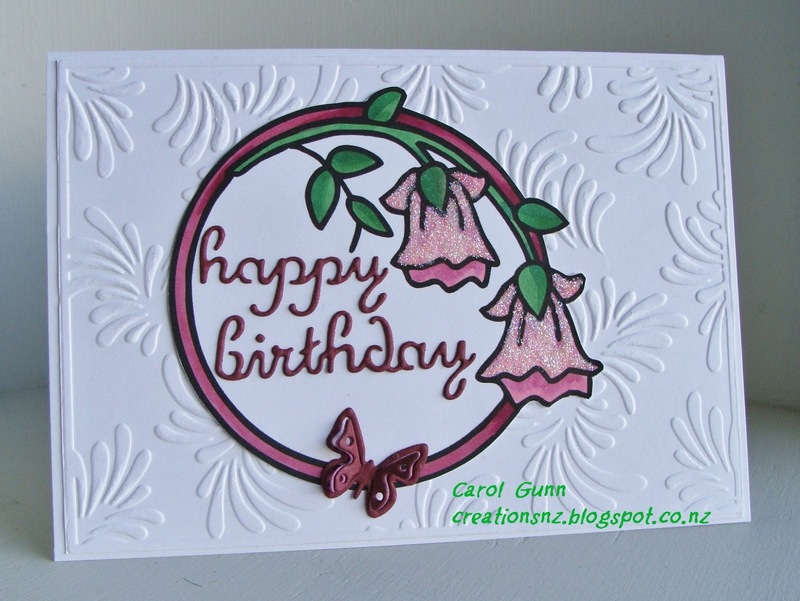 The flower is die cut using some shimmery paper, and I slightly sponged on some colours. You could see the glitter in this close up photo. 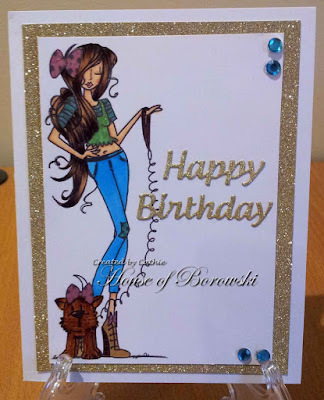 Die Cut Divas theme this month is "glitter", easy peasy! Have a go! I used Spellbinders Labels 16 for the image and mat, along with a border I made with my Cricut. 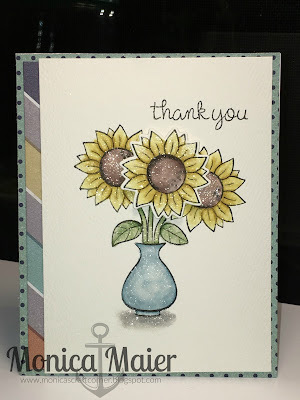 The image is Hedgehog Flower (Bugaboo Stamps), colored with Copics. My background paper has glittery stripes, and I added Cocoa stickles to the flower to make it a glittery Black Eyed Susan! You can visit me at Just A Nutter Paper Crafter for more information. Die Cut Divas' July glitter parade continues. What is more appropriate to celebrate the 4th of July than a nice cake delivered by a lass in red, white and blue? I had such fun coloring this. 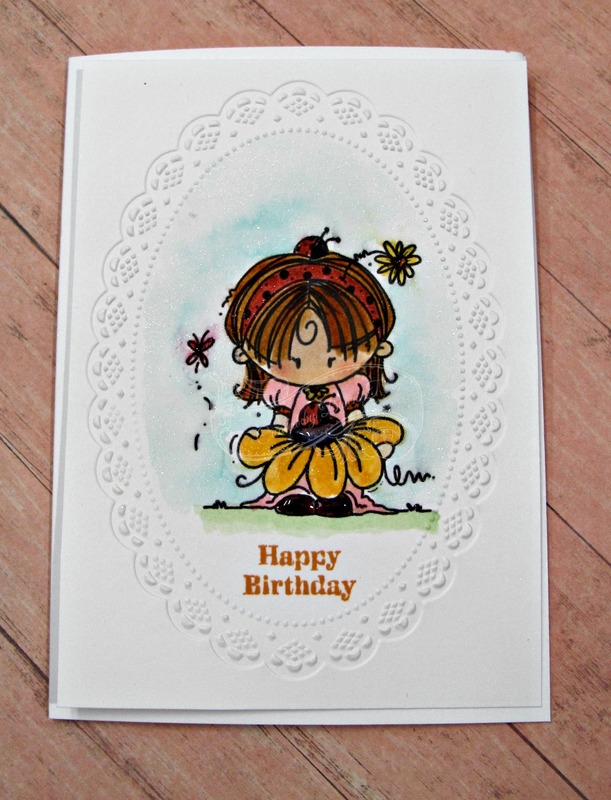 I always do with the Sun Bonnet lasses at Bugaboo stamps. I just can't resist them. I really can't. 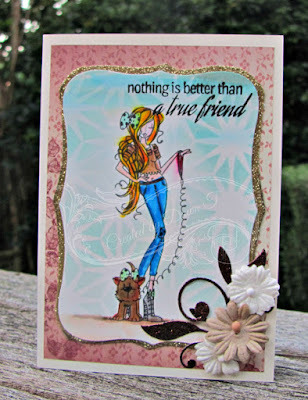 I hope you like my sample of glitter for Die Cut Divas' challenge for July, Make it glitter. You can find me at A Bit of This and That. 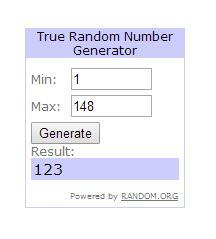 June Winner and DT picks!!! Please email is at thedcdivas@gmail.como claim your prize seen above. 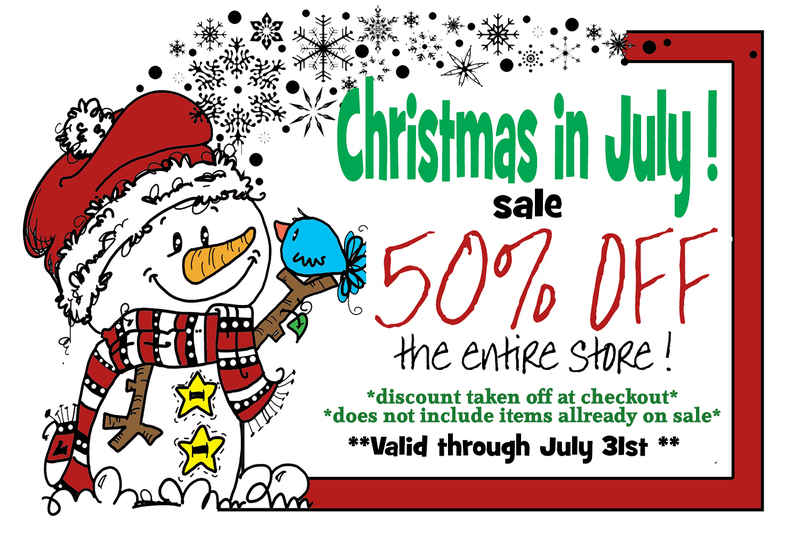 July 3rd - corrected email address above. Sorry about that. 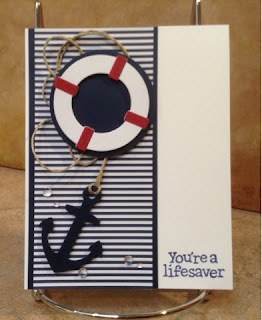 Monica - I'm a sucker for a nautical card and I love the card by cimbacreativefun. I love the use of dies with the twine and droplet accents, not to mention the stripes! Cindy - I really enjoy this shimmery card created by Zelda (Out Of Africa Creations) . I love the textures and dimension and everything about it. 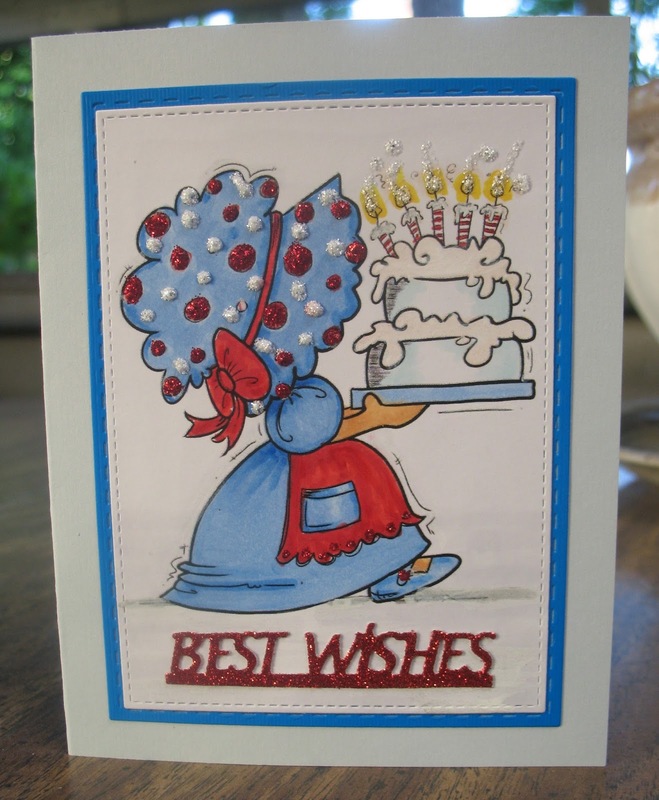 Arlene's choice was difficult to make; so many wonderful cards. I went for kind of a clean and crisp style this time by "Stamped for the Occasion"
Cathie - I loved not only the concept of this gift of a card with a matching box, I love how all the elements come together on the card. 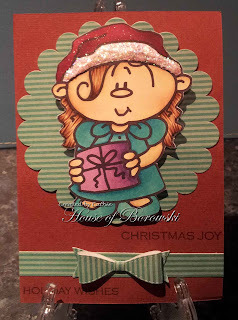 Michelle-I love creative,different die cuts and this just caught my eye! Thanks Yogi, for this very cool creation! July is already here. Can you believe it? Another challenge begins today. All you have to do is make it glitter in some way. If we can't tell it's glittering, you'll have to explain in your post how you made the card to make it glitter. It can glitter in the light (shine) or have glitter on it. Tell us how it glitters. 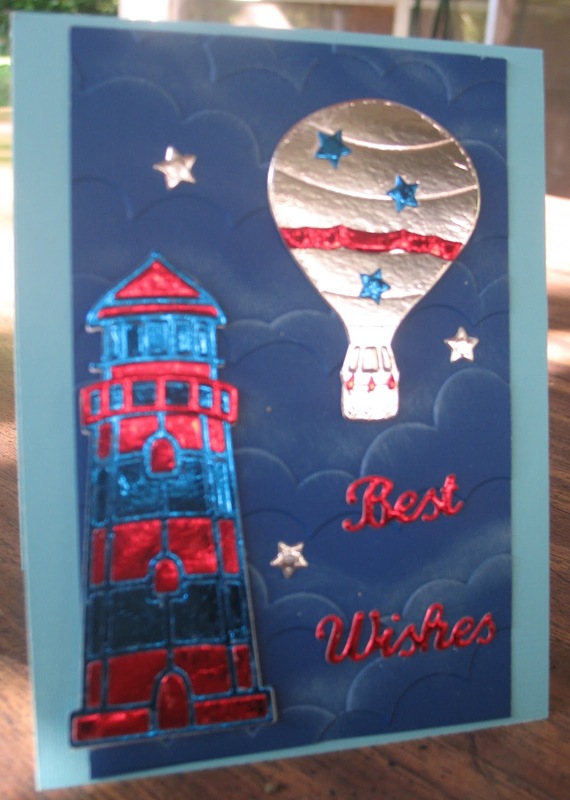 Arlene is all a glitter and shiny too, with a glittering, shiny lighthouse and similar hot air balloon from Elizabeth Craft Designs, available at Dies R Us. 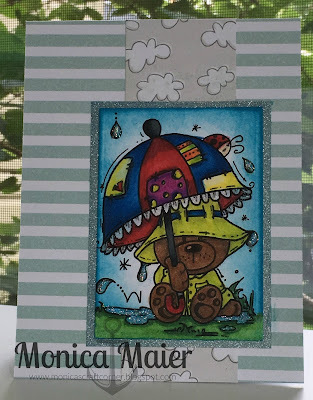 See more of Arlene's cards at A Bit of This and That. You can get more information at Just A Nutter Paper Crafter. Dawn has added lots of Wink of Stella glitter to her card. Cathie has added glitter via Sakura StarDust pens to her image.